Privation and loss prepared him to treasure the society of loved ones and to receive the Vision of the Redemption of the Dead. The painting reminds me of my grandfather’s courage and devotion in the face of hardship. At times in his life, he faced wolves of one sort or another who attempted to hurt or destroy him. Yet these trials only served to entrench the gospel in his soul and to make him the most tender of men. This love became an enduring blessing to his family and to the church he eventually led. Grandfather was born in Far West, Missouri, 13 November 1838, approximately two weeks after his father, Hyrum Smith, was unlawfully imprisoned with his brother, the Prophet Joseph Smith. A few days after his birth, he was nearly smothered by a mob who ransacked the family’s home looking for his father’s papers.2 It was four months before his mother, ill and in poverty, was able to take him to his father, then imprisoned in Liberty Jail in Clay County, Missouri. There, in that foul dungeon and in chains, his father saw him for the first time. It was also probably there that his father and the Prophet gave him a name and a blessing.3 He was only five years old when his father and uncle were murdered at Carthage and sealed their testimony of the restored gospel with their blood. Necessity forced young Joseph to assume the responsibilities generally considered a man’s work. Before he was eight years old, he drove one of his mother’s wagons to Winter Quarters, Nebraska, and on the journey west he also became responsible for the livestock. These duties continued after their arrival in the Salt Lake Valley on 23 September 1848.4 His mother, worn by persecution and pioneer rigors, died before he reached his fourteenth birthday. 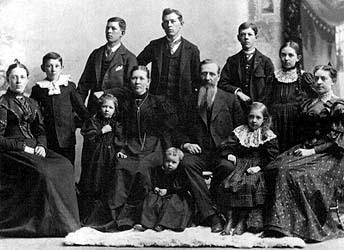 The Joseph F. and Julina Lambson Smith family, circa 1900. Back row, from left: Donetta, Wesley, George, Joseph F., Jr., David, Julina Clarissa (“Ina”), Mary Sophronia (“Mamie”). Front, from left: Emily, Julina Lambson Smith, Edith, Joseph F., and Rachel. The most impressive memory his living grandchildren have of Grandpapa is of him returning home from his office in the evening. He was tall and stately and dressed in a white hat and suit. The grandchildren waited for his loving greeting﻿—and for the small candies they knew he always carried in his pocket or kept in his desk especially for them. Loving grandfather that he was, he once decided to have a party for his grandchildren. He asked his daughters to take care of the details. Some prepared the entertainment, while others prepared the food and set the table with the best linen and china. When Grandpapa was told all was ready, he walked into the dining room and found his adult children and their spouses seated at the table. “Where are the grandchildren?” he asked. “They will be fed in the room where they are playing,” he was told. Grandpapa was kind to his children in correction. His son Willard remembered well his kindly guidance. Willard was small for his age, and one day, without provocation, he received a beating from the town bully. Weeks later, still smarting from the abuse, he decided to get even. On Valentine’s Day, he and his younger brother Frank made valentines. Willard made one for his tormentor. Carefully, he labored over a central figure with several little imps surrounding it, each pointing a devil’s fork and speaking a balloon message containing some unsavory names. It was delivered unsigned, and Frank was sworn to secrecy. Somehow Willard’s older brother Wesley received the valentine by mistake. Knowing it came from someone in the family, Wesley took it to their father, who placed it in his wallet. He made inquiry as to who sent the valentine but got no answer. Meanwhile, Frank was reaping rewards for his silence﻿—a small coin, Willard’s piece of cake, or some other coveted delight. Eventually, their mother overheard a conversation between the boys and learned who the culprit was. The following morning when Grandpapa came to breakfast, he gave each child except Willard his usual kiss. After Grandpapa had eaten, he asked Willard to come with him into the parlor. There Grandpapa sat down by the small table that held the family Bible, presented the offensive valentine, and laid it carefully on the table. Then he began to read. For each name on the valentine, he found scripture that fit and a penalty for using the bad word. Finished, he closed the Bible and invited Willard to come with him to the kitchen, where he burned the valentine in the coal stove. Putting his arms around his son, he kissed him and said good-bye. Grandpapa’s service in the Church covered a period of particularly virulent persecution. He was personally vilified in the press, and the Edmunds-Tucker Act of 1887 disenfranchised the Church. As a result, President Lorenzo Snow and his counselors found it necessary to issue bonds of indebtedness in order to restore financial stability to the Church. When Grandpapa became President of the Church three years later, he determined to dispose of the accumulated notes and bonds as quickly as possible. One afternoon in 1906, five years after he was sustained as President, his daughter Rachel saw him in the front hall as she was coming in from school. Grandpapa had been all over the Beehive House looking for Grandmother. “Where is your mother?” he inquired. “Well, baby,” he said, “I wanted your mother to be the first to know, but since you don’t know anything I will tell you.” In his hand he held a piece of paper. During his lifetime, death claimed several of his children. The hardest of these to bear was that of his firstborn, Mercy Josephine, for whom he had waited and prayed for many years. This child had come to him at a particularly difficult time in his life and had filled his heart with unspeakable joy. It was Grandfather’s habit to have his sons help with secretarial work in the evenings. He depended heavily on Hyrum and on my father, Joseph Fielding Smith, since they were members of the Quorum of the Twelve. Hyrum’s death at age forty-nine, in January 1918, was a crushing blow for Grandpapa. Added to the other separations, Hyrum’s death added much cause for Grandpapa to ponder, pray, and search the scriptures for answers about the hereafter and associations with loved ones who had passed away. The answers came shortly before his own passing. In 1918 Grandpapa’s health began to deteriorate, and he was confined to his room much of the time. During this time, he had several manifestations which he mentioned to my father. One of these, called afterward the Vision of the Redemption of the Dead, came the day before the October 1918 general conference. He spoke of it briefly during the opening session; then, following the meeting, he dictated the revelation in full to my father. On October 31, it was submitted to the leading councils of the Church, and it was unanimously accepted. This revelation, describing the Savior’s visit to the dead while his body was in the tomb, is now canonized as section 138 of the Doctrine and Covenants. Grandpapa died 19 November 1918. Death, which had taken so many of his loved ones, had finally reunited them. For him, the wolves were at last silent. This story can be found in Joseph Fielding Smith, Life of Joseph F. Smith (Salt Lake City: Deseret News Press, 1938), pp. 163–64. See Don C. Corbett, Mary Fielding Smith: Daughter of Britain (Salt Lake City: Deseret Book Co., 1966), pp. 84–85. 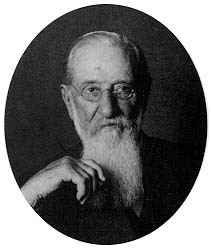 Life of Joseph F. Smith, pp. 131, 155. Recounted by Leonora Smith Nelson. Recounted by Julina Smith Hart. Audiotape recording of Willard R. Smith by his son Willard G. Smith; copy in possession of author; courtesy of Florence S. Jacobsen. Recounted by Miriam T. Meads. Diary of Joseph F. Smith, 6 June 1870; typescript in possession of author. In Conference Report, Apr. 1916, pp. 2, 3. Amelia Smith McConkie serves as Relief Society president of the Salt Lake Eagle Gate Stake.